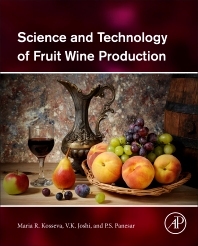 Science and Technology of Fruit Wine Production includes introductory chapters on the production of wine from fruits other than grapes, including their composition, chemistry, role, quality of raw material, medicinal values, quality factors, bioreactor technology, production, optimization, standardization, preservation, and evaluation of different wines, specialty wines, and brandies. Wine and its related products have been consumed since ancient times, not only for stimulatory and healthful properties, but also as an important adjunct to the human diet by increasing satisfaction and contributing to the relaxation necessary for proper digestion and absorption of food. Most wines are produced from grapes throughout the world, however, fruits other than grapes, including apple, plum, peach, pear, berries, cherries, currants, apricot, and many others can also be profitably utilized in the production of wines. The major problems in wine production, however, arise from the difficulty in extracting the sugar from the pulp of some of the fruits, or finding that the juices obtained lack in the requisite sugar contents, have higher acidity, more anthocyanins, or have poor fermentability. The book demonstrates that the application of enzymes in juice extraction, bioreactor technology, and biological de-acidification (MLF bacteria, or de-acidifying yeast like schizosaccharomyces pombe, and others) in wine production from non-grape fruits needs serious consideration. Dr Maria Kosseva joined the UNNC in 2012 as an Assistant Professor (Lecturer). Her professional background is in chemical cybernetics and bio/chemical engineering. After research spells at the Catholic University of Louvain-la-Neuve (Belgium), and the University of Cape Town (RSA), she has been occupied with a number of European-funded and industry-related projects at the University of Birmingham (UK), where also gained a PGCHE teaching diploma in 2004. Since 2006, Maria had worked as a Lecturer at the University College Dublin (UCD), Ireland, where also established and led the Microbial Engineering Laboratory. At UCD, she had acted as a Director of the joint Masters’ Programme in Biopharmaceutical Engineering since its launch in 2006. Dr Kosseva has been an external scientific consultant to a number of international companies, such as Pfizer International Ltd (IRE), Idemitsu Kosan Co Ltd, Sofia Airport (Fuel Department), Petroleum Refinery (BG), Maxsys Ltd (UK), and Hitachi Plant Engineering Ltd (Japan). In 2009 she was invited to Hiroshima University as a Senior Researcher. Maria has been awarded a large number of international research grants such as Japan Society for the Promotion of Science, British Council, Royal Society, Medical Research Council (UK), Foundation of Research and Development (RSA), Water Research Commission (RSA), and so on. She is a member of the American Association for the Advancement of Science (AAAS), the Institution of Chemical Engineers (IChemE), the European Federation of Biotechnology, and others. Maria is acting as an expert on the European Commission programmes and actions such as IEE, KBBE, and Marie Curie. Professor V.K. Joshi, MSc, PhD, is an eminent scientist and a teacher with more than 35 years research experience in fruit fermentation technology, fermented foods, food toxicology, biocolor, quality assurance, and waste utilization.He is fellow of BRSI and ISHA and life member of AFST(I). He is the former head of the Department of Postharvest Technology and the head of Department of Food Science and Technology, at the same university. A recipient of several awards for research and teaching, he has guided several postgraduate students, authored or edited more than 10 books and more than 300 research, reviews, book chapters and popular articles besides presenting several lead papers in conferences and seminars. He had edited special issue of JSIR in 1998 on advances in biotechnology, and Natural Product Radiant on ‘Wine production from Non-Grape fruits’ as a Guest Editor. Had organized Summer School of ICAR as a Director, as a Principal Investigator, handled several research projects funded by ICAR, DBT, DST and NHB. Recently, he retired from the university service and is engaged in editing as Editor-in-chief of International Journal Food and Fermentation Technology besides several other journals , writing/ editing books, providing consultancy on wine production technology, carrying out academic pursuits including scientific input as a member of panel on “Food Contaminants” and “Standards of Alcoholic Beverages” of FSSAI. Dr. P.S. Panesar is working as Professor, Food Biotechnology Research Laboratory, Department of Food Engineering & Technology, S.L. Institute of Engineering and Technology (Deemed University: Established by Govt. of India), Longowal, Punjab. India. In 2005, he has been awarded BOYSCAST (Better Opportunities for Young Scientists in Chosen Areas of Science & Technology) fellowship by Department of Science & Technology (DST), Ministry of Science & Technology, Govt. of India, to carry out advance research in Industrial Biotechnology at Chembiotech labs, University of Birmingham Research Park, UK. His postdoctoral research focused on the development of immobilized cell technology for the production of lactic acid from whey. In 1999, Dr Panesar was awarded Young Scientist Fellowship by Punjab State Council for Science & Technology, India. He has published more than 80 international/national scientific papers, 50 book reviews in peer-reviewed journals, 20 chapters and has authored/edited 05 books. He is also member of the editorial Advisory Boards of national/international Journals including “International Journal of Biological Macromolecules”. Excellent albeit a little too scientific for a beginner, would be wonderful if you had taken some courses in winemaking and learned the chemistry (which is assumed). This is a research book, not really a winemaking manual per se, although the knowledge is in there!